The world is a crazy place, full of mixed up people and misdirected rage and Glenn Beck. We as one nation (under God, or under 'nothing?' as some notable Brits might say, or eventually underwater like Waterworld might say) can't agree on the issues. Healthcare, or guns, or what brand of trash bag Ke$ha is (experts say Hefty, but COULD IT BE GLAD? ), Earth is a mixed up place. Just look at Live To Dance. One thing we should agree on is that the world is very cruel to certain peoples based on the color of their skin, or their beliefs, and to counteract that, the US was founded on principals of equality, even if they weren't quite practiced. And a couple decades ago, a very notable man stood up for what he thought was right. 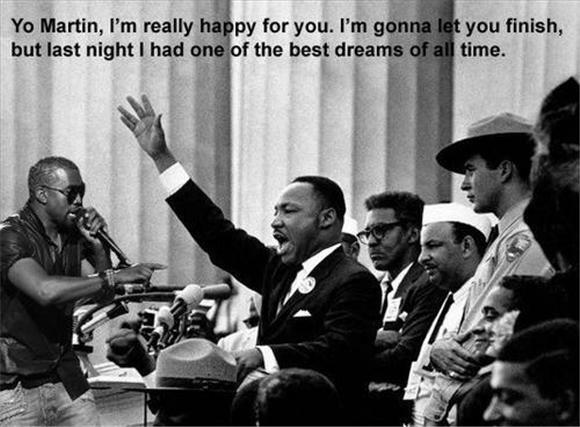 Years later we're still not quite at the dream, but the picture is a lot clearer, and it's an official holiday now. So in the interest of being reverent, here's a song for the day. Enjoy your day off, or if you're in the office today (or out there in the field, or on the floor, or wherever you earn that bread), then we'll meet you for happy hour. Because I too have a dream... that we can all get hammered together, as one. Who's with me?